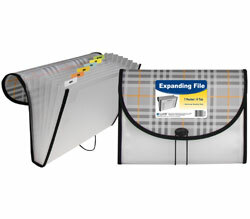 Plaid expanding files are made of durable, acid-free polypropylene. Plaid expanding files are made of durable, acid-free polypropylene. Includes pre-printed tab inserts, black stitched edges and button and elastic closure. 13-pocket/12-tab. Letter size. Plaid. Hi, I'm Jen at C-Line. And today we're going to talk about our 13-Pocket, Letter Size Expanding File in the Plaid Fashion Design. This stylish expanding file keeps you organized and your files easily accessible. It's made from polypropylene and features our plaid design with the black stitched edges. The expanding file comes with preprinted tab inserts that are perfect for organizing paperwork and presentations. They are printed on the front and blank on the back, allowing you to create custom tab inserts, too. The expanding file features a fixed base and expands at the top. It has 12 dividers, which create 13 sections and hold up to 400 sheets of paper. The button and elastic closure keep your documents secure for on-the-go work and organization. The fashionable plaid pattern lets you organize and transport your files with style, whether for home, school or business. Order yours now! That's all the time we have for today. I'm Jen at C-Line, and thanks for watching.